No more looking for broken or weak wooden planks when you renovate with low maintenance aluminum. We offer expert assistance in planning your bleacher renovation, and have a variety of aluminum plank profiles which can provide solid adaptation to most existing understructures. 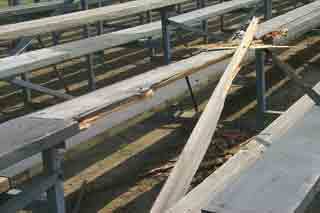 Don't risk injury to your spectators because someone fell through or off your old bleachers. Many old or unsafe bleachers can be retrofitted using the existing framework by adding aluminum planking to replace deteriorated wood planks and to close up unsafe gaps. View our Bleacher Components used in Renovations. Recent building & life safety codes & consumer safety guidelines may require compliance. Don't wait for a costly accident to fix your bleachers. 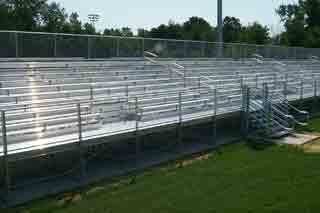 Let us assist you in giving your old used bleachers a new and improved look. We will evaluate your used bleacher system and help you determine what actions are needed to bring your outdoor stadium seating up to current safety codes.